BBC NEWS | Middle East | What could lie behind Syria raid? 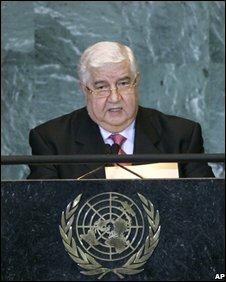 While there have been relatively high-level contacts between the two governments - US Secretary of State Condoleezza Rice meeting the Syrian Foreign Minister Walid al-Muallem on the sidelines of the UN General Assembly just a few weeks ago - they have hardly generated any warmth. Washington has even been lukewarm to Turkey's efforts to broker a peace deal between Israel and Syria. All of this is in marked contrast to European efforts to engage the Syrians. With French President Nicolas Sarkozy in the lead, a number of European countries have sought to bring Syria in from the cold. But despite glimmerings of dissent from the State Department, the Bush administration has held firm to its policy of no substantive talks with Syria unless - as the Americans put it - Damascus decides to take a more "positive role" in the region. With the Bush administration on the way out, this US military incursion may represent something of a parting shot against the Syrians. It's clear that if Senator Barrack Obama were to win the White House, his key advisers are among the strongest advocates of engaging with Damascus across a broad spectrum of issues.